If you want to know what alpha-GPC is, why people supplement with it, and how it can benefit you, then you want to read this article. Alpha-GPC is one of the most effective sources of choline, which the body uses to make a neurotransmitter that aids in muscle contraction and memory. Alpha-GPC is a very promising molecule and can potentially improve memory and increase power output but there isn’t much evidence on it right now. Alpha-GPC remains one of the more promising supplements for academic athletes, or anyone else who wants to support their brain while fostering their physical strength. I ain’t no beta-alanine, I’m an Alpha-GPC. Clearly the best way to start an article talking about a manly man’s supplement is with some hamfisted poetry but, hey, it’s been a long-time coming for this article and I’m excited; it’s one of my babies after all. Alpha-GPC is a supplement that, within it, contains promise to both athletics and cognition. Pending future evidence it could very well be the thing you give to your mom to help her stave off cognitive decline while you slip a bit in your pre-workout drink to hit a new max. Plus it’s somewhat close to the (somewhat abandoned these days) classical definition of a nootropic. You know, the definition closer to “at first, do no harm” that dictates that a proper nootropic needs to be effective, healthy, and without any major side-effect? Alpha-GPC is a contender for that title. Even if the evidence can’t convince you yet, it’s worth getting a small bit to test if you want an extra push in the gym that’s without the side-effects of classical stimulants like caffeine. Why Do People Supplement with Alpha-GPC? What Are the Benefits of Alpha-GPC? What Does Alpha-GPC Not Do? What Is the Clinically Effective Dose of Alpha-GPC? What Types of Results Should I Expect with Alpha-GPC? Does Alpha-GPC Have Any Side-Effects? It should be mentioned that while choline is a nutrient it is not an essential vitamin or mineral. It’s just something found in many foods (mostly meat products) that is essential for optimal organ function. If you’ve ever heard of “methylation” (perhaps when looking at folic acid and B12 supplements) choline is a big player here. Choline is a dietary supplement that’s found in many forms such as choline bitartrate and CDP-choline and, while the former tends to be seen as a health molecule, the latter and alpha-GPC are both designed with cognitive benefits in mind. CDP-choline and alpha-GPC are stable and can reach the brain tissue after oral ingestion, somewhat bypassing the liver. Due to the role of choline in the liver most dietary choline is kept here so, if you want an influx in the brain, you need a form of choline that has a “get out of the liver free” card. When in the brain, these two choline delivery agents are thought to help the body produce more of the neurotransmitter acetylcholine, which is a major player in learning and memory and the most important neurotransmitter for muscle contraction. The provision of choline to the brain can also help produce more phosphatidylcholine (PC) which is vital to the structure of membranes. CDP-choline has the added goodie of providing some cytidine, which then becomes uridine (another potential nutrient). Alpha-GPC provides said glycerophosphate, a component of cell membranes that by itself is not too well studied as a dietary supplement. While most supplemental sources of alpha-GPC are synthesized from either egg or soy lecithin these days it’s also a natural component of meat and organs. So ultimately, alpha-GPC is one of the two choline-delivery agents that’s designed to not only get to the brain to a higher degree than choline alone but may also provide another goodie in the process. The most common usage of alpha-GPC seems to be for the purpose of cognitive enhancement, being one of the two choline forms that’s able to reach the brain. However, due to past research (that we will get into in a second) it, unlike CDP-choline, is also heavily used by athletes looking for an increase in power output. Most usage of alpha-GPC focuses on the mind and the muscle, with some fringe claims of fat burning and longevity associated with a potential increase in growth hormone after supplementation. The benefits of Alpha-GPC, while enticing, are somewhat limited by the human research on it. It is one of those topics that has tons of animal and in vitro evidence but surprisingly little human evidence for some reason. So already that’s pretty cool. Usually these studies are less creative in how they assess power, but throwing a barbell as if doing a bench press is something we can all understand practically (it was on a Smith machine, so no accidental decapitations). The next study to find a benefit to strength was using 600 mg alpha-GPC supplementation where, after just a week of supplementation, improvements were seen as assessed by isometric mid-thigh pulls (a strength test similar to locking out a deadlift). It was later expanded upon in this study where the researchers compared 250 mg Alpha-GPC to 500 mg Alpha-GPC using caffeine and placebo as controls. It found, surprisingly, that 250 mg Alpha-GPC was the best at increasing power and velocity compared to placebo once again using isometric mid-thigh pulls (among other tests). So on one hand the data is rather limited but, on the other hand, it’s a supplement that is assessing power beyond Wingate tests (cycling) which is by far the most common research technique. The above results seem to be catered towards weightlifters specifically and, with benefits coming in after a single week, make it a very novel and effective pre-workout addition. Alpha-GPC has limited data to assess power output but it seems to work in a single week and improves power in ways that can benefit weightlifters and powerlifters. Acetylcholine signaling is reduced in dementia and Alzheimer’s so getting some extra choline to the brain is a nice band-aid effect (not curative but alleviates symptoms). The ability to make phosphatidylcholine, and glycerophosphate also being a membrane component, might be able to mend neurons a bit (theoretically curative). This was first tested in aged rats where alpha-GPC was able to restore the structure of damaged neurons and revitalize choline signaling (likely related to increased phospholipid synthesis in neurons, which are what membranes are made up). Since Alzheimer’s and dementia are associated with reduced phospholipid synthesis, this is a beneficial change. Human studies note that very high dose alpha-GPC (400 mg thrice daily for a total daily dose of 1,200 mg) is able to reduce symptoms of Alzheimer’s after six months and…that’s really it. This dose has also once been used to help improve the rate of mental recovery after a stroke but that seems to be it. Not much new research on this topic in the last decade. Alpha-GPC at very high doses (1,200 mg daily) seem to hold some promise for helping otherwise damaged brains repair some of the damage but it’s not as well researched a topic as one would expect given the potential benefits. It’s also uncertain if lower doses have the same benefits since these studies only use high doses. A little known benefit of alpha-GPC is its role in enhancing nonheme iron absorption. Nonheme iron, the iron found in plant products rather than animal products, can be enhanced with a surprisingly low dose of only 46 mg alpha-GPC which was comparable to 100 mg vitamin C.
Unfortunately it doesn’t seem to be an “added” benefit however as the combination wasn’t better than either isolated component and when nonheme iron absorption by other factors the further addition of alpha-GPC (70 mg) doesn’t increase absorption further. Alpha-GPC is one of many factors that could help with iron absorption but, ultimately, it’s not overly potent or noteworthy and performs equally to vitamin C (which is a lot more present in food products and cheaper as a supplement). Most compounds initially get research done on the promising aspects and, once that is done, are revisited and usually the research is “refined” meaning that the null (negative) results come in usually at a later date. Alpha-GPC is in this state right now and, because of that, there is an apparent lack of data showing where alpha-GPC fails. It’s just a matter of time, and alpha-GPC should be getting null data soon once more data is published, but for now what we can prove it doesn’t do is limited. Alpha-GPC is sometimes recommended for its ability to increase growth hormone, which also tie into supposed fat burning effects. Alpha-GPC is able to do this. There are two studies on the matter where 600 mg taken before a workout was able to augment the exercise-induced growth hormone release where 1,000 mg has been seen to work even without exercise. So, I guess technically speaking alpha-GPC increases growth hormone secretion. The only problem is that this data probably doesn’t mean much. Growth hormone has been noted to be increased, in the short term (2 hours or less) by many supplements including L-arginine, L-citrulline, and even creatine. Some of these have even reduced growth hormone acutely, like both L-arginine and creatine (yay, paradoxical results!). But none of these resulted in changes to muscle growth or fat loss since the pulse was so short. If you want to increase growth hormone and get the benefits of growth hormone it needs to be increased 24/7 rather than in single pulses. And none of these supplements have 24-hour data on them, only for single pulses that are too short to affect muscle growth over the long term. But, at the very least, there’s at least one study noting increased fat oxidation while under the influence of the increased growth hormone (60 to 120 minutes after ingestion of 1,000 mg) so if you really wanted to micromanage your workout I guess it could work? No clue and no promises. Alpha-GPC is technically able to increase growth hormone. Like many supplements, though, it’s a technical increase rather than one that’s expected to result in actual benefits of growth hormone to the body due to it’s short exposure time. This just means that marketing is true in saying it increases growth hormone but the claims attached to that such fat loss, longevity, and muscle growth, are probably not gonna happen. Alpha-GPC is also at times used as a nootropic (cognitive enhancer) not only for the aforementioned protective benefits but also for focus and stimulation. Unfortunately, data on this topic is fairly weak. While some users report cognitive benefits that they can “feel,” the only data on otherwise healthy subjects found that neither 250 mg nor 500 mg was able to improve psychomotor vigilance (a combination of sustained attention and reaction time). Alpha-GPC can be easily argued as being healthy for the brain, especially long-term, but whether or not it provides acute cognitive benefits is pretty up in the air right now. Whether or not there are any acute and perceivable benefits of alpha-GPC is not something the data has delved into just yet. For athletic purposes and, if you are aiming for acute cognitive effects (that research does not yet support, despite some user reports that may or may not be placebo) the ideal dosage range is 250 to 600 mg. There is evidence to suggest that leaning towards 250 mg is better than the higher doses but ultimately we need more data to confirm that. For attempting to treat cognitive decline, or repairing damage incurred in the brain, a higher dose of 1,200 mg (400 mg thrice daily) has been tested with moderate benefits. A lower dose of 250 mg for cognitively well people who want a pre-workout boost and a higher dose of 1,200 mg for those with cognitive damage aiming to repair it are the two go-to doses at this moment in time. When looking at the research all we can say to “expect” is that there should be some improvements in strength and power output after a week of supplementation. If the specific tests conducted mean anything then perhaps it could help you lock out a deadlift? Who knows but, at the very least, if you’re keeping track of your weights they should go up a bit. Some users do report a better mind-muscle connection after using alpha-GPC (perhaps since acetylcholine mediates the connection between your contractile muscle and your brain) but there’s no data to suggest the frequency of this. Consider it a happy little accident if it happens. At this moment in time there are no “known” side-effects that the research has identified. Now, I use “known” in quotations intentionally. Alpha-GPC is one of my favorite molecules to both take and research so I do try to look for trends in side-effects either from people who take it by itself and from Ascend users. It seems that, while infrequent, some people report lethargic and brain fog side-effects and, at times, a large spike in libido. Both seem quite infrequent and seem to be related to the overall dose of choline being too high (perhaps due to a sensitivity to choline?) so, if you experience these side-effects, opt for less alpha-GPC and hope that it goes away. Alpha-GPC is a relatively under-researched but overall very promising dietary supplement that seems to be one of the few supplements that can outright improve power output in a week or less. Furthermore it seems quite healthy for the brain and seems to be a great candidate for the classical definition of “nootropic” (something that improves cognition and general wellness of the brain without side-effects) which is not overly common as well. For academic athletes alpha-GPC is perhaps one of the top three supplements to keep an eye out for when it comes to future research. And all of this is why I included 300 mg of alpha-GPC in Ascend, along with four other ingredients proven to support and enhance your focus, memory, mental speed, creativity, mood, and overall brain health. 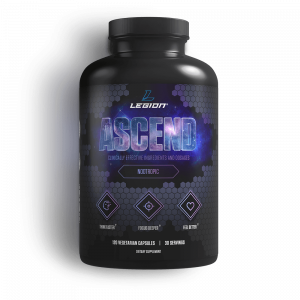 So, if you want a healthier, happier, and higher-performing brain that allows you to think faster, focus deeper, and feel better, then you want to try ASCEND today. What’s your take on alpha-GPC? Have anything else to share? Let me know in the comments below!